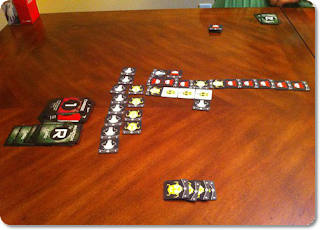 At Origins, my family had the privilege of previewing a new game from Derpy Games called NanoBot Battle Arena. 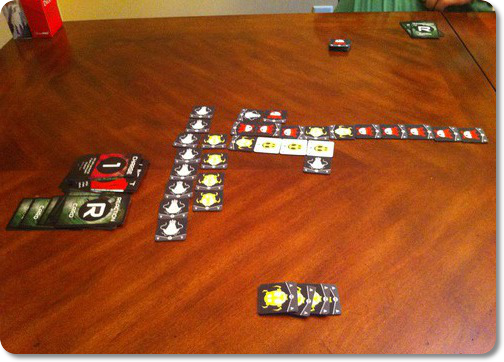 This is a tile laying game where the goal is to take your set of NanoBots and make the longest chain possible. Meanwhile, your opponents are trying to thwart your plans as they seek to create the longest chain. Currently the game is in the funding process on Kickstarter with game entry point of $25, but the fine folks at Derpy Games sent us a prototype copy to play and give our thoughts on. Since my family had played it at Origins, I thought it might be good to get their thoughts on the game especially since this can also be viewed as a very family-friendly game. Well, one way to measure how good something is comes down to if you are willing to take the time to tell or teach others about it. That is exactly what my sons did, they taught others how to play. So what were everyone’s thoughts on the game? Listen to this installment of the 5 Minute Initiative and find out!